As we head down the stretch of Indoor Percussion for 2007, I can’t help but think "What’s This All About?" Really now……back in the day of guard contests, there would usually be a color guard stomping around the gym floor herking and jerking their way to "Opener’s", " Color Pre’s" and "Closers." I loved those color guards…………they were awesome! 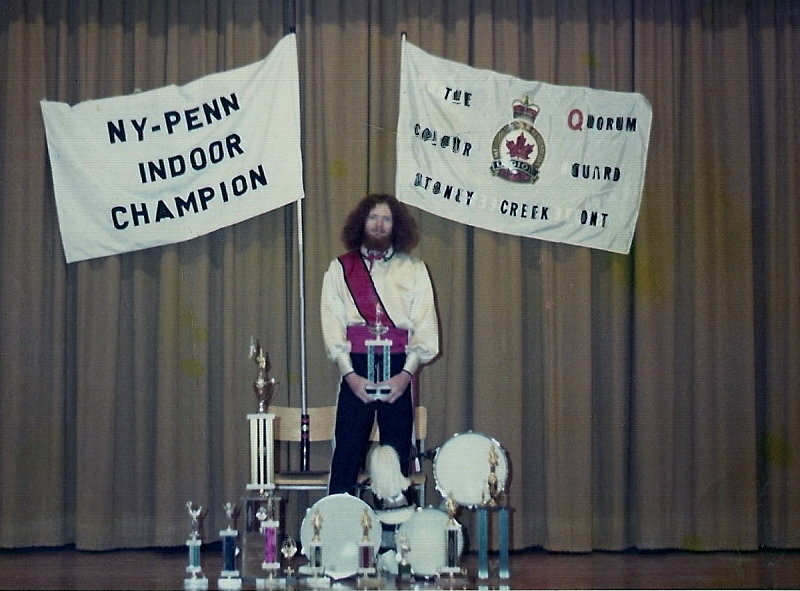 In fact there usually would be a drummer, mostly a snare drummer but sometimes as in the show of the great Quorum Color Guard from Stoney Creek, Ontario, Canada there would be this really tall, long haired red headed guy slamming away on his tris. He was simply INCREDIBLE, as was the Aquinas Color Guard. So how did this lonely snare or tri drummer evolve into WGI Indoor Percussion Championships and really now – "What’s This All About?" As far as I can tell a man named Ward Durrett, whom we all know and love, one day decided that he wanted to see drum lines play in the winter as well as the summer. He came up with the idea of an indoor drum line championship that would take place during the winter months – ending in a championship in April. The indoor drum line competition would take place on a gym floor. Actually I believe the first took place on a stage where everyone stood still and played, and that they would design a show that had a musical and visual storyline that would entertain fans. Voila! 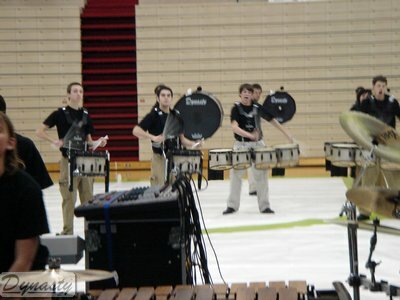 the WGI Indoor Drum line as we know it today. That first championship I believe might have had 4-6 competitors and this year when we all travel to Dayton, OH to see the 2007 WGI Percussion Indoor Championships we will watch a 3 day event with close to 200 competitors! Wow….so now "What’s This All About?" Indoor Percussion is simply the most interesting and exciting form of percussion that I have seen in my 46 year career. The fact that interests me most is that ANYONE can do it. For example middle schools, high schools, junior colleges, colleges and independent people can all have an indoor drum line that competes in one of the hundreds of circuits every winter. All it takes is a bunch of players, some drums, keyboards, possible electronic equipment and a show and away we go. You can spend nothing except travel expenses and show fees or you can spend literally tens of thousands of dollars on elaborate floors, costumes, shows and musical and electronic equipment. Many percussion teachers have decided to start their own independent competitive drum line. They have applied for and received 501(c)3 non profit status, purchased their own equipment, created elaborate fund raising schemes, and are now in their own right legitimate non profits – some running on $100,000 budgets and more. An entire sub-culture has developed for designers, judges and fans. Yes there are many what we call "main stream" designers such as Neil Larrivie, Tom Angust, Scott Johnson, Erik Johnson and Sean Vega involved in indoor percussion. However, the new "sub- culture" includes such indoor greats as Tim Fairbanks, Shane Gwaltney, Mark Reynolds, Jeff Huffman, Martin Hotte, Jim Wunderlich, Mike Jackson, Ike Jackson, Terry Sanders and many others. They have quietly forged ahead all these years designing incredibly musical, visual and emotionally charged shows – that if put on the correct stage in Las Vegas, I believe would make a fortune for the venue that chose to display any one of these designers shows. Indoor percussion usually has a story line that is followed throughout the show, builds as the season progresses and develops. The kids understand and perform accordingly …. usually at incredible tempos with underlying body movements that normally as a percussion teacher we would all laugh at and say "Are you serious?" The performers never even consider these thoughts of course and instead perform at levels that continue to amaze me time and time again. The parts are challenging and played extremely well, considering the tempos and movement going on and it adds that extra layer of excitement and interest that is sometimes missing from summer drum corps or marching band drumming. In addition to this sub-culture of drumming, there is now emerging an entire market of indoor drum line equipment. Smaller, more articulate snare drums such as the "Shorty" and others are emerging as the choice of indoor drum lines. The drum stick, drumhead and cymbal companies have all developed indoor sticks, mallets, heads and cymbals that usually provide a more articulate sound with different effects than the regular "outdoor" equipment. Manufacturers and designers are spending countless hours together to get the right sound, the right feel and the right weight of instrument or implement. It is simply fascinating to see it all evolve to the degree it has. Finally we get to the real question of "What’s This All About?" What it is all about is the fact that kids have another musical outlet to enjoy and use to better themselves as individuals, as an ensemble and as an organization. Kids that probably never would make the one spot on the school’s jazz band or the 4 or 5 spots in the concert band now have an outlet to explore during the winter season. They have a chance to learn, play and perform and it is making percussion in general much better. High school keyboard players are playing 4-mallet technique as if they were born with 4 mallets. Battery players are playing high level rudimental parts that normally wouldn’t be played until they reached some of the better drum corps around the country. Just ask any college professor today about the talent level and training of incoming freshmen to their programs. These students are better trained, more rounded and they have the confidence to compete and sustain in high profile college percussion programs. So in a nutshell "That’s What This Is All About!" Come and see it all Dayton, OH at the Nutter Center April 19, 20 and 21, 2007. You won’t be disappointed. You will see amazingly designed shows, wonderful performers and thousands of kids and young adults that are having the times of their lives. And I guarantee that if you come, you will walk away from the experience a different drummer or fan. You will have a huge smile on your face, your mind will be full of wonder and thinking hard with many new ideas about drumming and you will be so excited that you will definitely be back for more. And that my friend is "What This Is All About!" Publisher’s Note: "The Beat" is a regular column that explores the world of drumming and percussion arts – written and hosted by Allan Murray. Allan played in the London Midlanders, Toronto Optimists Drum and Bugle corps before moving to California to play snare drum in the Anaheim Kingsmen. He has studied music at the University of South Florida, taught and/or arranged for such Drum and Bugle corps as the 1975 Oakland Crusaders, 1976-77 Seneca Optimists, 1978 Spirit of Atlanta, 1982-86 Suncoast Sound, 1989-91 and 1998-99 Boston Crusaders, the 1999-2001 Pioneer, the 1994 Magic of Orlando and the undefeated 1994 Empire Statesmen. Internationally He has taught clinics in Canada, United States, Japan, South Africa and Indonesia. Allan was a music arranger and Director of Distribution Operations for Columbia Pictures Music Publications now Warner Bros. Music Publications in Miami, Florida for 10 years. He has been involved in some form of the marching music activity for 46 years. On April 1, 1998 he joined DEG Music Products, Inc. as their new Dynasty USA product line manager responsible for all sales, marketing, research and design of marching brass, bugles and percussion. On August 10, 2002 he was promoted to Vice President, Sales and Marketing, Dynasty USA. Questions may be sent to Allan, which he may include in future editors of The Beat at AskAllan [at] drumcorpsplanet [dot] com?subject=Question%20from%20The%20Beat%20on%20DCP . Posted by DCP Publisher on Wednesday, March 14th, 2007. Filed under The Beat.